The Tasmanian Public Sector, also referred to as the Total State Sector, comprised the General Government Sector, the Public Non-Financial Corporations and the Public Financial Corporations sectors, with entities classified according to the nature of activities they undertake. 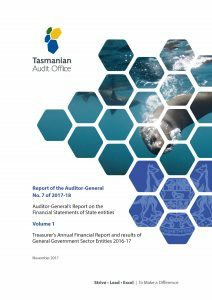 The focus of the Report is on the General Government Sector, which consisted of Government departments and not-for-profit State entities controlled and mainly financed by the Tasmanian Government. The primary function of these entities was to provide public services which were mainly non-market in nature and were for the collective consumption of the community. Other State entities included in the Report were statutory authorities and other non-profit entities not consolidated into the General Government Sector financial statements. The Treasurer’s Annual Financial Report included the audited General Government Sector and Total State Sector financial statements and the Public Account statements. It also included other information, such as an overview of the Fiscal Strategy and the Loan Council Outcome, which were not audited. The Report provides a financial analysis of the General Government Sector and Total State Sector and of the Public Account statements. Results and assessments of the financial performance and position of other General Government Sector entities, Executive and Legislature and other State entities have been summarised in a separate Chapters of the full Report.